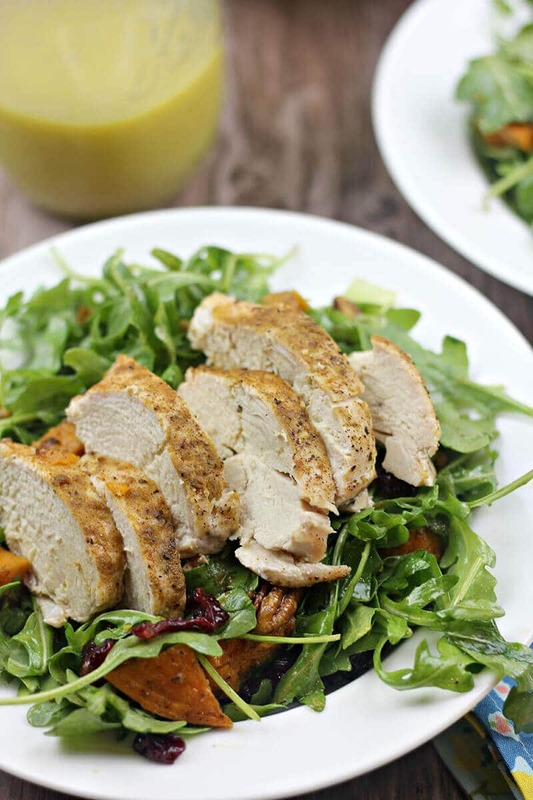 Arugula salad with roasted sweet potatoes, chicken, and honey-roasted pecans—this salad is a one-dish, quick and easy weeknight meal! Have you tried any of the meal prep services? 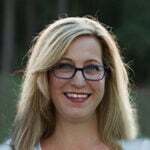 Our kids are using Hello Fresh and they all love it. I think the directions are a little cumbersome, but the food is certainly good. A couple of weeks ago, we were visiting Mal and Gavin and they made this salad based on one they had tried in a Hello Fresh meal. We enjoyed it so much, I decided to recreate it, albeit with a few changes. The original meal called for Parmesan Crusted Chicken (here’s my version of that! ), which was delicious, but a little more trouble than I wanted. My idea was to try and make this a one-pan meal and super easy. 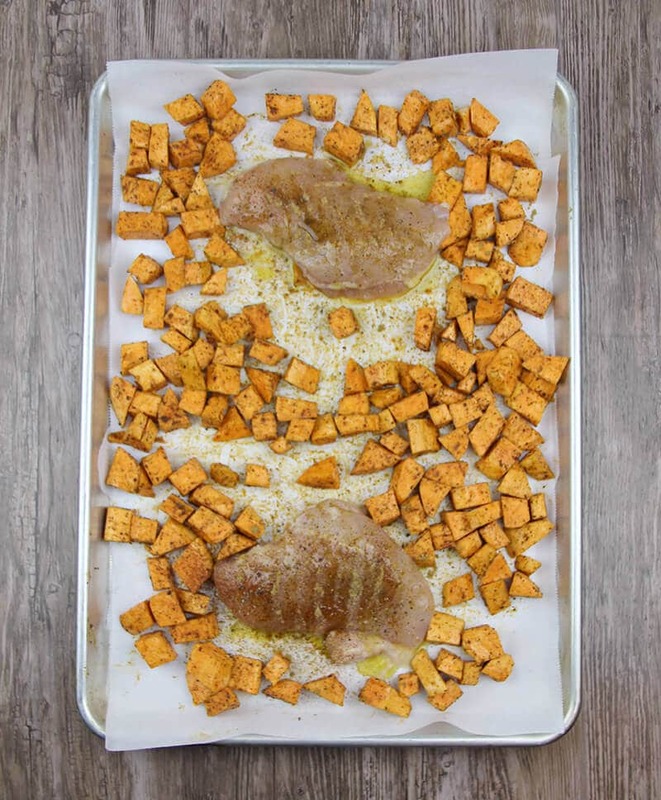 Start by peeling and chopping two sweet potatoes and placing on a parchment-lined baking sheet. Sprinkle the potatoes with chili powder, cumin, salt, and pepper, and drizzle some olive oil over the top. Then take your hands and mix it all together and spread out the potatoes, making room to add some chicken breasts to the pan. I just used two chicken breasts but you can add a third if you’re feeding more than 2-3 people. Sprinkle a little more chili powder and cumin over the chicken breasts and drizzle some olive oil. Then place the pan in a pre-heated 450° oven for about 25 minutes. When the potatoes are tender and the chicken is done in the middle, remove from oven and allow the chicken to rest for a few minutes, then slice into 1-inch pieces. While the chicken is resting, you can roast the pecans in the oven. And let’s take just a minute to talk about those pecans. Sunnyland Farms offers gift baskets, shelled pecans, candies, and much more online from their website, so you can get the best pecans straight from the source! To roast the pecans, place pecan halves on a small baking sheet (I used a cake pan) and drizzle with a little honey. Then stir them around and roast for about 7 minutes. That’s it! Easiest thing ever! To put it all together, add the cranberries, pecans, scallions, and cheese to the arugula in a large salad bowl. Toss with a little lemon vinaigrette and then divide among four salad plates. 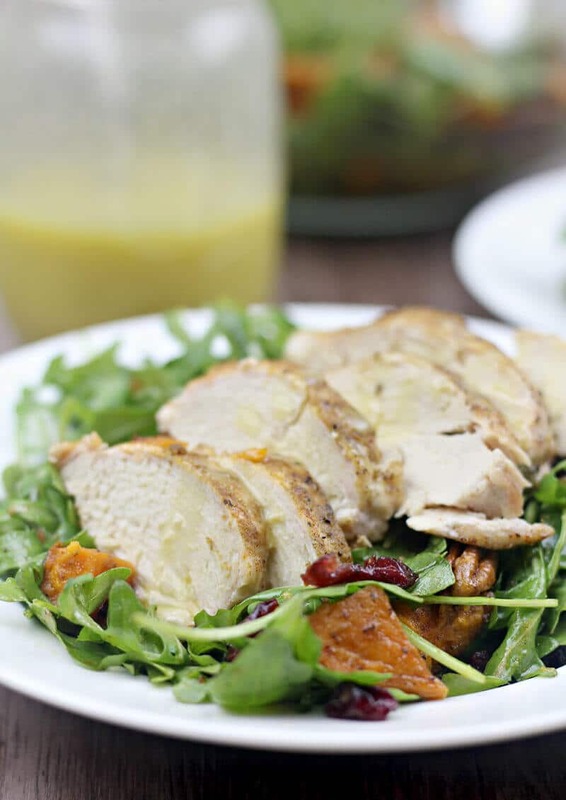 Place sliced chicken on top of the salad and drizzle with a little more lemon vinaigrette. Serve with some crusty French bread and enjoy! 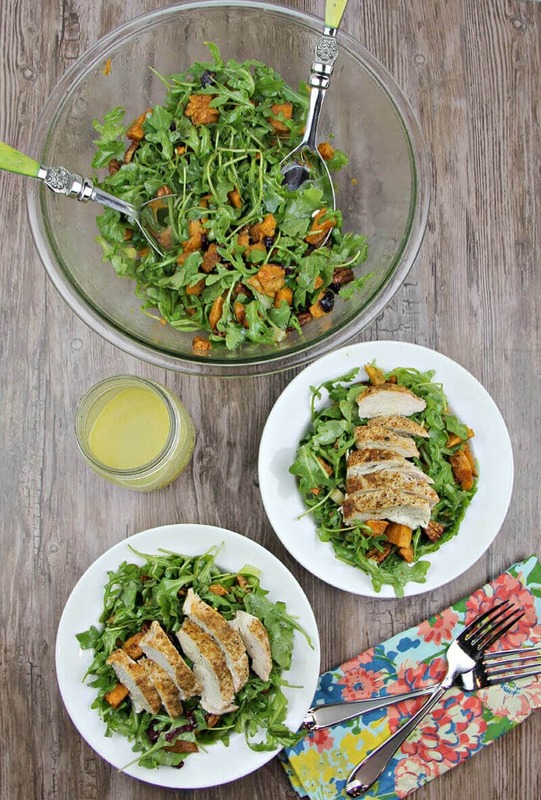 Arugula salad with roasted sweet potatoes, chicken, and honey-roasted pecans--this salad is a one-dish, quick and easy weeknight meal! Peel and chop sweet potatoes into ½-inch cubes. 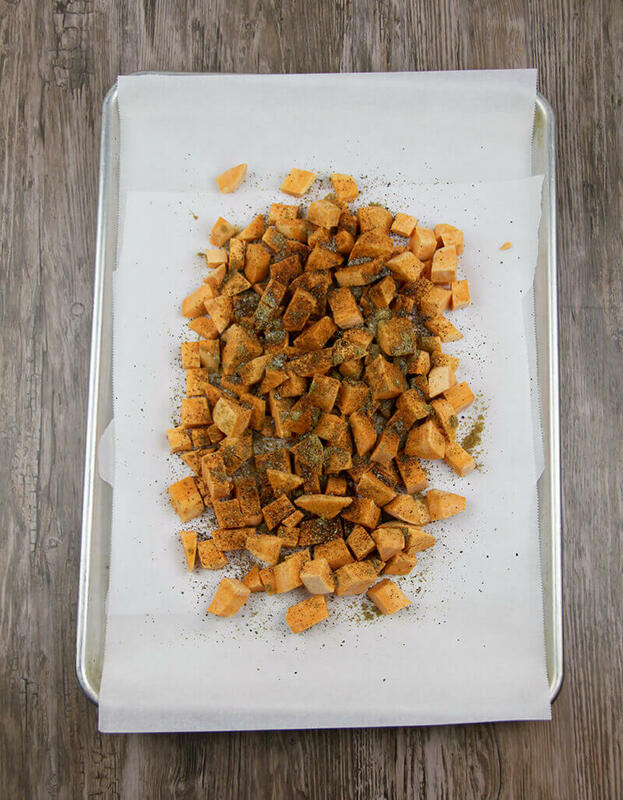 Toss on a baking sheet with 2 tablespoons olive oil, 1 teaspoon chili powder, 1 teaspoon cumin, salt, and freshly ground black pepper, leaving room for the chicken. Place chicken breasts on baking sheet and drizzle with remaining 1 tablespoon olive oil, then sprinkle with 1 teaspoon chili powder, 1 teaspoon cumin, salt, and pepper. Roast 25-30 minutes, until potatoes are tender and chicken is done in the middle. You may need to stir the potatoes around halfway through cooking to prevent burning. Remove pan from oven. Allow chicken to rest while pecans are roasting. Toss pecans with honey in a 9-inch cake pan and roast pecans about 7 minutes. Remove from oven. 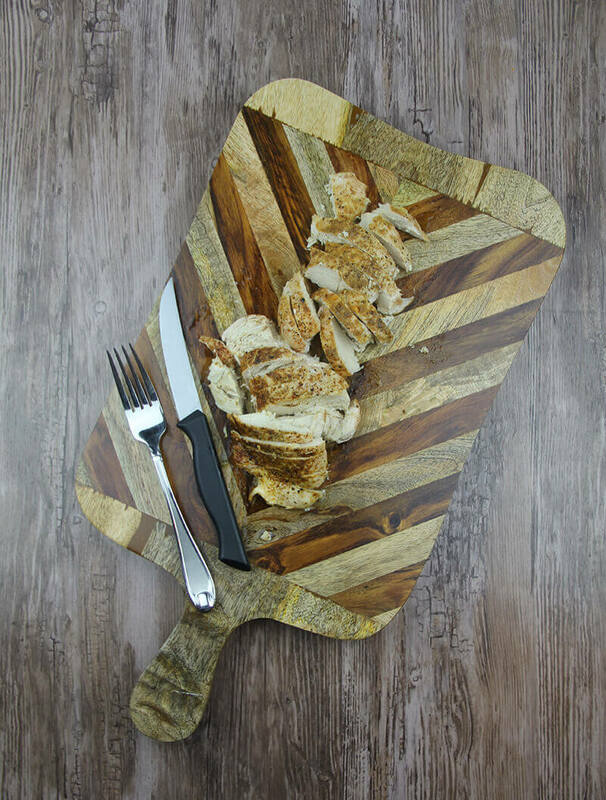 Chop chicken into 1-inch slices. 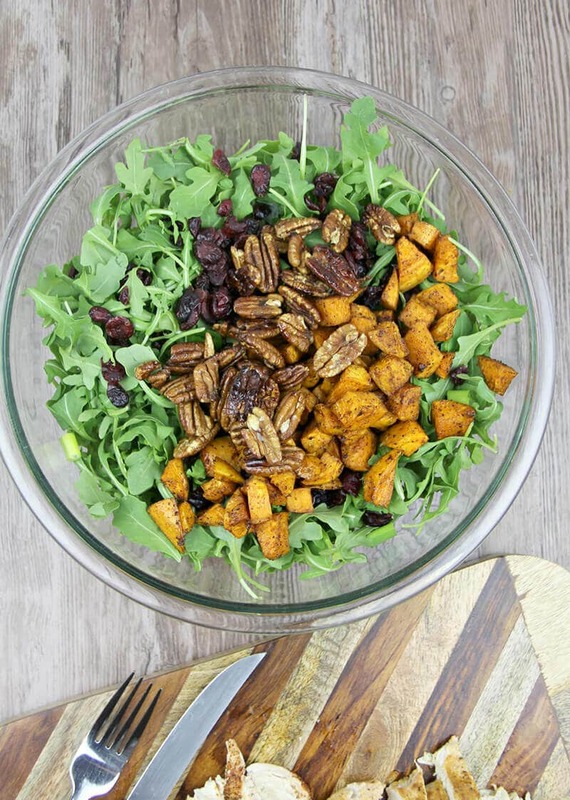 In large salad bowl, combine arugula, cranberries, scallions, cheese, and pecans. Toss with lemon vinaigrette. Sprinkle salad with a little salt and freshly ground black pepper. Divide salad among four salad plates and top with sliced chicken. Drizzle a little lemon vinaigrette on chicken and serve. Easy recipe for Lemon Vinaigrette. Thanks to the National Pecan Shellers Association, Sunnyland Farms, and Golden Farms Peanut and Tree Nuts for allowing me a backstage pass to the pecan harvesting and farming industry! And sending me home with some terrific goodies!